This is not only a story about Jesus. It is a story about the deaths and losses of our lives. We all have been there. Some still are. Today the liturgy is short. There is no Eucharist. The church is still empty and barren. There’s not much to say or see on this day. Today is mostly a day of silence, sitting, and waiting. That’s how it is on the morning after. That’s how it is the morning after you receive the news. That’s how it is the morning after you see the body. That’s how it is the morning after the burial. Every Good Friday is followed by a Holy Saturday. You wake up and realize that last night’s nightmare wasn’t just a bad dream. It is the reality and truth of today’s life. The author of Lamentations speaks our truth (Lamentations 3:1-9, 19-24). We have been “brought into darkness without any light.” We are “besieged and enveloped with bitterness and tribulation.” We are walled in and cannot escape. We are bound in chains. We call and cry for help but our prayer is shut out. We are homeless. There is nothing but the tomb. We sit and wait in the hell of our life. We sit and wait in the hell of our life. We sit and wait in the hell of our life. Our portion, our share, we are told is in the Lord, his steadfast love, his never ending mercies, his great faithfulness. Where is that today? Where is the steadfast love of the Lord on Holy Saturday? Where are his never ending mercies and great faithfulness on the morning after? Hell. That’s where the Lord’s steadfast love is on Holy Saturday. That’s where his never ending mercies are today. That’s where the Lord’s great faithfulness is on the morning after. Holy Saturday is when Christ descends into the hell of our life, breaking the bonds of death, and setting the captives free. Holy Saturday is the day death and Hades tremble in fear, and regret ever having tried to take captive the author and creator of life. At the presence of Christ the trembling and quaking of Hades will become the contractions that birth new life. 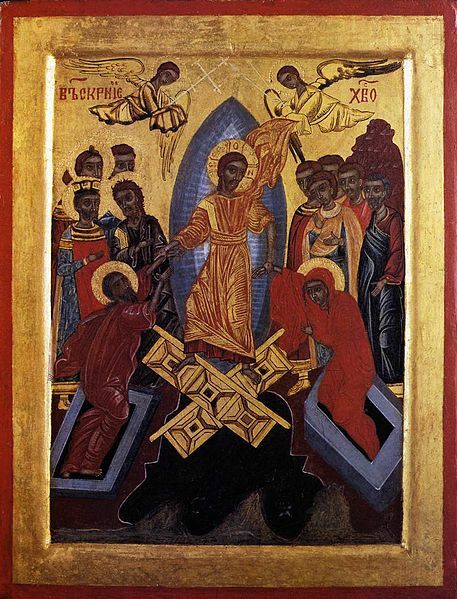 The tomb of Holy Saturday will become the womb of Easter Sunday. That is the promise hidden deep within every tomb. Meanwhile it’s still hell and we sit and wait. We sit and wait with a promise and the one who will keep that promise. Mike, this is absolutely beautiful. thank you. A blessed Easter to you and Cyndi. Thank you Jennifer. I hope you and your family are having a blessed and joyous Easter. Very powerful posts coming from you at this time. Beautiful life affirming powerful loving posts of faith and hope and inspired Spirit. Thank you Stephanie. Christ is risen. We are blessed to have already received the good news on this side of the Atlantic. Hallelujah, Christ is Risen! Excellent!!!!!! So appropriate for our family at this time. Thank you for these words and their message. Thank you Betty. I am sorry that you and your family are in the morning after and hope that Easter joy is close to you all. What day are we commanded to set aside as the Hallowed Sabbath? Jews observe the Sabbath on Saturday, Christians on Sunday.